I highly recommend The Venue at Craig Ranch! We offer 3 to 12 month leases. No more than 2 consecutive days without prior approval from the office. We have private detached garages available to lease. Yes, we have resort style pool with grilling stations and cabanas. Yes, onsite storage is available for a fee. We have a Billiard Room, Dog Park, Putting Green and Walking Trails to Rowlet Park. Non-refundable pet fee of $400. for the first animal plus $100 for each additional animal. DIRECTIONS: Via Sam Rayburn Tollway - Head southwest on Sam Rayburn Tollway and take the exit toward Craig Ranch Pkwy/Exchange Pkwy/Custer Rd/F.M 2478. Merge onto TX 121 S then turn right onto S Custer Rd. The leasing office will be on the right. Welcome home to our apartments in McKinney, TX. Our luxury community sets a precedent for style and esteem in upscale living. 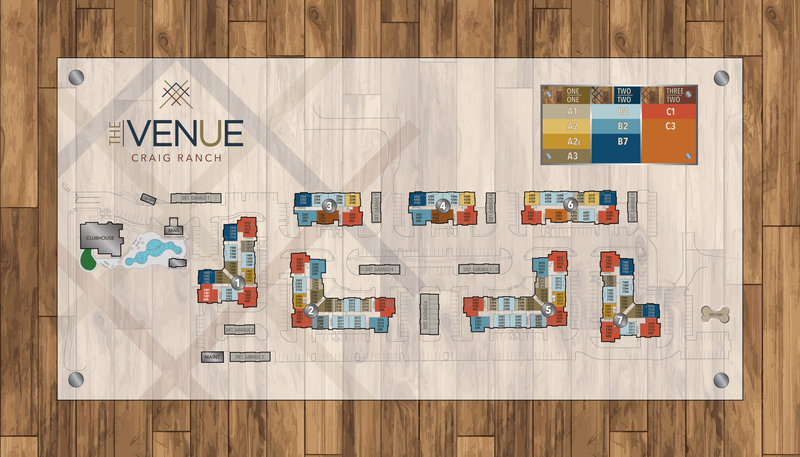 Our Craig Ranch apartments offer spacious one, two, and three bedroom floor plans fused with sophisticated amenities and conveniences which will enhance your lifestyle. You will enjoy spacious and open layouts perfect for relaxing after a long day at the office or entertaining guests on the weekend. Step outside your home and enjoy the amenities our community has to offer. From a resort-style pool to our state-of-the-art fitness center, there is something for everybody at our luxury apartments in McKinney, TX. Enjoy the game room featuring a Billiard table, an on-site dog park, and so much more. Our Craig Ranch apartments are located moments away from an array of dining, shopping, and entertainment options including Topgolf, Stonebriar Centre, Allen Premium Outlets, and TPC Craig Ranch Golf Course. Our location offers easy access to US-75, Sam Rayburn 121 Toll, and Highway 380. Contact our professional leasing staff today to schedule a private tour of your new community.